Omega -3 fatty acids are an important nutrient for overall health as well as well as heart health. They are categorized under essential fatty acids (EFA) as our bodies cannot produce them and they must be got through food or supplements. Though there isn’t any official Recommended Daily Allowance (RDA) for omega-3, it is believed that we don’t get enough in our diet. To read more about Omega-3 Fatty Acids and the different sources, click here: Omega-3 Fatty acids-How much and How to get them? So why wild caught salmon? Salmon by itself is actually a white fish. Wild caught salmon is caught in their natural environment and feed on insects, shrimp, plankton and small fish, which gives the salmon its remarkable deep red flesh coloring. Whereas, farm raised salmon live in cages with thousands of other fish and hence cannot move as much as wild caught. They are also fed commercially produced fish food which results in an inferior white flesh color. Since this is not acceptable, salmon farmers add a chemical dye to the feed to get the pink/red flesh in farmed salmon. Hence wild caught salmon is not just tastier to eat but is nutritionally far better than farmed. Wild caught definitely has more Omega-3, vitamins(including Vit.D), minerals, along with high levels of selenium and iodine. 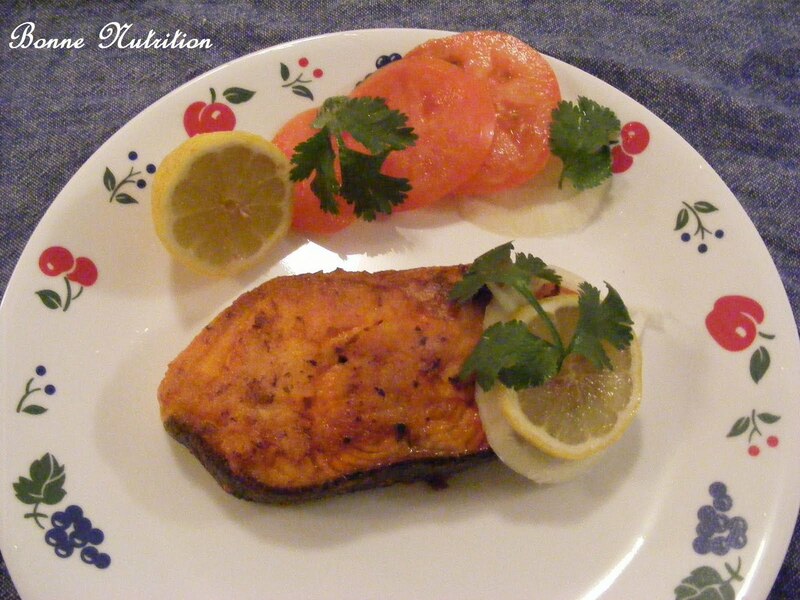 Here is a quick and easy Salmon recipe that my kids love as it’s tangy and not-spicy. The Dijon mustard gives an amazing flavor, but you can replace it with whole ground mustard if you want. In a bowl make the marinade by mixing all the ingredients (except salmon). Taste for salt. 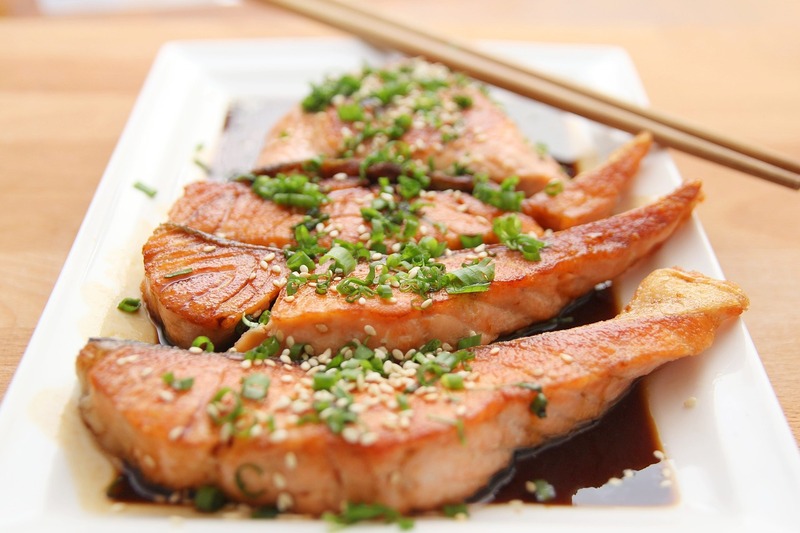 Marinate the salmon generously with the marinade and set aside for 15-20 mins. Preheat the oven to 230 C (450F). Line a baking tray with parchment paper and lay the salmon skin side down on the tray (if you want a crispy skin, then you can pan-fry on high heat for 5 mins and then put them on the baking tray). Cook for about 15 mins (about 10-12 mins if you have first pan fried). Serve with a side of grilled vegetables. 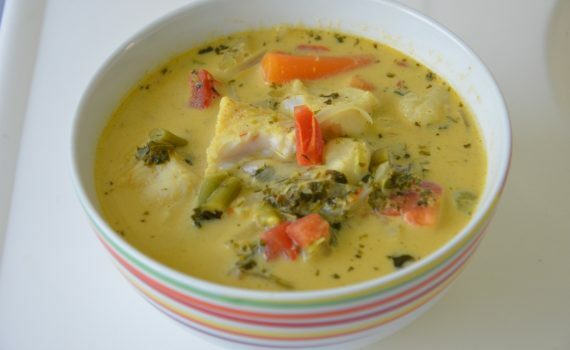 A traditional Kerala Fish curry with a nutritional twist- vegetables! This twist is the result of my lack of time (or some may say laziness) in making a separate vegetable dish to go along with this. But I must say it tasted great and got everyone eating the extra vegetables! It’s winter, so I added some frozen winter vegetables to it. The original Meen (Fish) Molee doesn’t have extra vegetables added to it-so you could omit it if you want the authentic dish. For those looking for one dish with protein+veg, this is ideal. Heat oil in a kadai, add the cloves, cinnamon stick, grated ginger and garlic and sliced onions. In the meanwhile, shallow fry the fish in a little oil. Keep aside. When the onions have turned translucent add the coconut milk and a cup of water. Stir for 2-3 minutes, then add the tomatoes and another cup of water. Do not stir too much or the fish will break. Bass(striped); Herring; Mackerel, Oysters(Pacific); Sablefish(also called black cod);Salmon; Trout(freshwater);Tuna. Wash the fish well (traditionally fish in India is washed in water,then some tumeric and lemon juice is applied to the pieces and kept for 1/2 an hour,and then washed off again). Mix the tandoori masala, yogurt and vinegar and taste for salt. If required,add a little salt. Coat the fish with the tandoori masala and let it marinate in the fridge for a couple of hours. Bake at 350 degrees for about 15 minutes or you could also shallow fry it in a pan till done. Squeeze some lime juice over it just before serving. 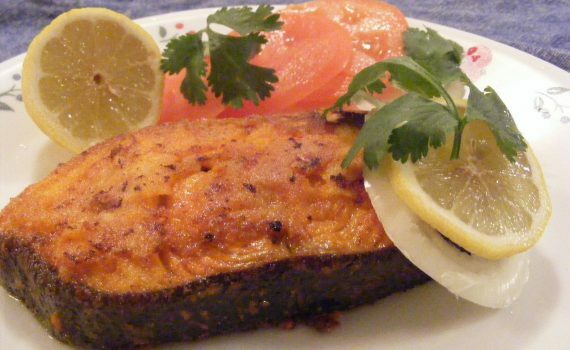 Serve the tandoori fish with some lemon wedges and some onion rings. Here’s one more reason to increase your “oily” fish intake-the omega-3-fatty acids found in fish have shown to halt and slow down the age-related macular degeneration (AMD), in lay-man’s terms: AMD basically is a medical condition which is mostly seen in older adults and results in the loss of vision in the center of the visual field. The research and findings conducted by Dr Elaine Chong at the University of Melbourne,Australia, involved 90,000 participants and showed that a diet rich in omega-3 fatty acids could cut the risk of developing AMD by 38%. Experts suggest eating oily fish like salmons,mackerel,tuna,shellfish and herring about twice a week to get the benefits of omega-3! Telegraph: Diet rich in oilyfish can cut risk of developing eye disease. 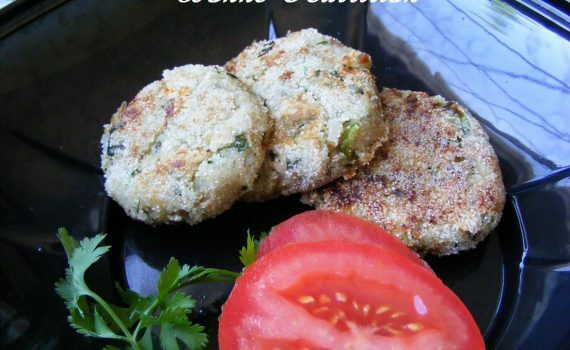 Now a simple and tasty way of including fish into your diet: fish cakes or “cutlets” as they are called in India. This is my mom’s method of making cutlets. Mom would first steam mackerel,then take out the bones and mix it with mashed potatoes and coat them in rava/ semolina instead of using bread crumbs. Rava absorbs much less oil and tastes equally nice. I used canned tuna,but it tastes great with just about any fish you fancy. In a bowl coarsely mash the potatoes. Drain the water from the tuna and add the tuna,chopped onions,cilantro,chillies,ginger +garlic paste and salt to the mashed potatoes and mix well. Shape into cutlets and shallow fry till the cutlets turn golden brown. Serve hot with chutney or tomato sauce.